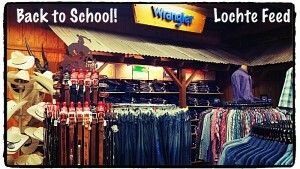 Check out this great deal on your favorite western wear – Buy any 2 Wrangler Apparel items and get a $10 mail-in rebate! This deal includes men’s, women’s & children’s apparel. We carry western shirts, work shirts, blouses for women and full selection of Wrangler jeans for men, women and children. Save on back to school clothing at your local Lochte Feed & General Store. Hurry in, mail in rebate purchases between August 1-20, 2017. Offer expires August 20, 2017. While you’re here, you’ll find everything you need for back to school clothing and a huge selection of products for a successful show season this year. Make Lochte Feed your show season headquarters. This entry was posted on Sunday, July 23rd, 2017 at 3:48 pm	and is filed under Events, News & Updates. You can follow any responses to this entry through the RSS 2.0 feed. Both comments and pings are currently closed.